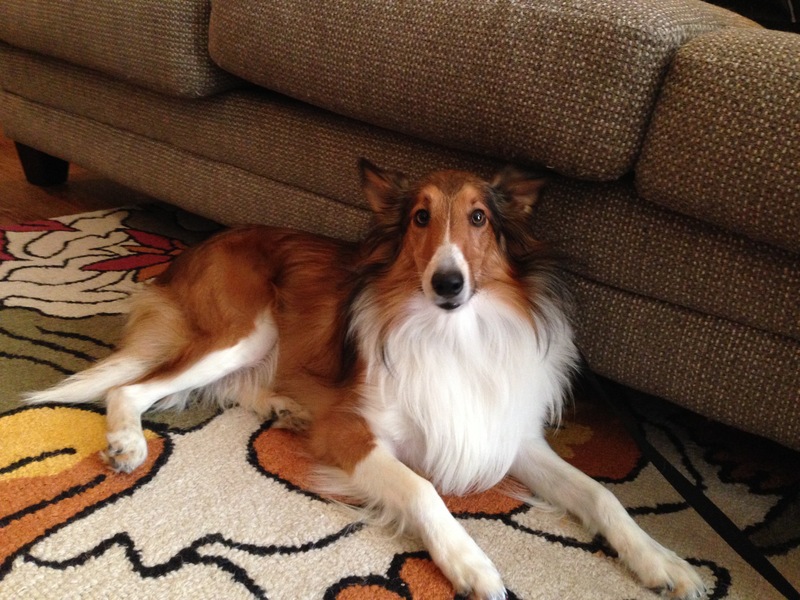 Minnie is a one-year-old Sheltie who is fearful of strangers, especially if they are male. Whenever any come into her home, she runs and hides in the other room. When I first arrived, Minnie bolted across the room as far away as she could get. I avoided looking at her, didn’t try to pet, talk to or interact with her in any way. For dogs who are insecure about meeting new people, the best thing you can do is ignore them completely and wait for them to come to you. Its common for people to want to hold a dog in place and have the dog receive a lot of love and affection from the people they are fearful of thinking this will help the dog learn that they are good people. But if you were afraid of spiders, my holding you down and having one crawl over your hand would hardly be a good way to get you over your fears. In fact, this action would likely have the opposite effect. I suggested that from now on the guardian instruct her guests to ignore the dog completely. By ignoring the dog until it become accustomed to the new person and waiting for curiosity to kick in, we give it the opportunity to discover the new person is not a threat on their own. But because running away had become’s Minnie’s default way of coping, we needed to change things up so that she could be prompted to develop a new way of dealing with the situation. I did this by placing her on a leash and then standing on it a few feet away from where it was attached to her collar. This technique is called flooding and can be quite effective when conducted properly. The idea is to introduce the target the dog fears in a low intensity so that the dog can learn to simply “be” with the target without anything bad happening. In Minnie’s case, she was petrified of new males and whenever any came over she had to endure their touching her. Even though what they were doing wasn’t negative to them, it was a negative experience for the dog due to being held down and forced to go through it. But instead of holding the dog, I used a leash to block it from being able to move away. This is far less invasive as the dog sees the leash as restraining them, not the human. But the crucial difference was my not trying to touch or interact with the dog in any way. This was a much lower level of exposure than she was used to and it allowed her to relax enough to lay down beside me. A few minutes after that video was shot, Minnie started to sniff in my direction, then directly sniff me. When she did this I remained still and didn’t say or do anything. This was Minnie’s literal first step and I wanted it to start and end on her initiative with a positive outcome. A couple minutes later I was feeding her treats out of my hand. But this only happened when Minnie was away from her guardian. When the dog was sitting directly under her, she would not take a treat from me. But after having her reposition nearer to myself, she would willingly take a treat without hesitation. I ran through a very specific structured meeting ritual for Minnie’s guardian to follow. It will help the dog practice being around men and move forward when the dog shows signs of interacting in a more dog way; by scent. Only when the dog starts to show interest in the male with his nose should the human start to interact with the dog. And once they start to interact, it needs to be in a structured way so that the dog can process it. An important part of Minnie’s rehabilitation will be to build up her trust in the authority and leadership of her guardian. To help in this regard I went over some ways to uses rules and boundaries to add structure and discipline in Minnie’s life. Because walking a dog in a controlled heel literally places the dog in the follower position, I wanted to make sure that Minnie’s guardian could walk Minnie this way. I fitted her up with a Martingale collar and showed her guardian how to add the special twist of the leash to stop her from pulling. We used the stairs to practice correcting and leading Minnie in a heel until she was following without correction. Now that Minnie was paying attention to her guardian and knew how to walk at a heel, we exited the apartment for a short walk. By taking our time and not proceeding when the dog started to get excited, Minnie’s guardian noticed how much easier it was to walk her. Minnie was still a little skittish when I was in her line of view, but the guardian was doing a great job of leading the dog and correcting her when she got out of position or lost focus. As we continued, I could see a number of positive changes to her posture and movement. Regular walks like this will help drain some of Minnie’s excess energy. By itself this isn’t going to solve her fear of men, but it will make the other exercises much easier. Minnie confirmed this was soon as we returned from the walk. As soon as she was off the leash, she moved to the corner of the apartment behind the chairs and kitchen table. But this time, her guardian didn’t allow her to deal with the situation by trying to run away. By the end of the session Minnie was much calmer and seemed to be getting more relaxed in my presence. It is going to take time and practice with her guardian and their male friends before Minnie stops fearing men she does not know. But the more that her guardian leads her confidently, the less concerned Minnie will be. And as she has more exposure to men who don’t try to pet or do anything to her until she is ready, she will learn that they aren’t to be feared.